Hello to my ASL Comrades. I am very pleased to announce that our new Issue #45 was transmitted this evening. Any active e subscriber should have received a copy in the e-mail I have on file, if you did not and think you should have, just let me know and I'll check your subscription status. I have a busy few days coming up with visits out of town so be patient if you do not hear back from me right away, I plan on catching up with everything to do with the newsletter by the end of the weekend. The Krinkelterwald: Another good looking tourney style scenario from Steve Johns with a reinforced company from Volksgrenadier Division 277 slamming into the unfortunate souls of the USA 99th Infantry Division at the beginning of the Battle of the Bulge. The German has 5 victory hexes on Board 75. The GIs have some prepared fire zones making the way into the woods more difficult for the attacker. The Block on the Trail to Hell: The latest from my Bougainville series finds a company from the 3rd Marine Division trying to clear the trail on Board 37. The Japanese will not go quietly and have a pillbox and some trenches to bolster the defense, headed up by a HMG and 1st liners from the 6th Infantry Division. Tourney sized and lots of close in fighting with both sides usually pretty beat up by game end. Boxing Day: A unique scenario from yasl vet Andy Howard finds us on Maaloy Island, represented by the southern half of the Gavutu - Tanambogo map. The Germans had taken the island in the invasion of Norway, including the artillery battery on the top of the hill. The British Commandos and Norwegian elite army troops are tasked with silencing the guns and wrecking the island's facilities including all buildings, Ammo and Oil Storage. Plays quick after the initial turn. Die Verdammten: It's judgement day for the 3rd Reich in this late-war slugfest by Ted Wilcox as fleeing elements of the German 9th Army are being pursued by elements of both the 1st Ukrainian Front and the 1st Belorussian Front. The Germans are looking to exit while the Russians are doing their best to prevent it. On half boards of 42, 59 & 67. We also have another great Tactical Tips article from Carl Nogueira on anti-tank tactics for infantry and one from Bob 'Kedge' Johnson on his Experience in 'Gold Beach' at the Big-Mo-Fo Tourney at this past Nor'easter. 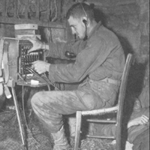 As for our last Issue, Dispatches from the Bunker #44 was our 20th Anniversary Issue with Tom Morin's latest HASL project, centering on the town of Rees, Germany on the Rhine River in 1945, with the British trying to take the town. This Issue comes in at a whopping 42 Pages with the HASL, 5 scenarios for it along with a 5 date Campaign Game. The Issue and HASL Chapter take up one e-mail and there is a separate e-mail containing the HASL map and VASL files. Carl Noguiera also has his latest Tactical Tips article, this time on SCWs. To celebrate our latest pdf. issue #45 I am continuing to offer a discounted re-subscription for any current subscriber who wants to take advantage of the discounted re- subscription cost of $13.00 for 4 pdf issues, (normally $15.00 for new subscribers, a newbie pays just $14.00). until my October Update comes out. I'm also offering pdf Back Issues for $3.00 if complete or $2.00 if missing content that was re-published by MMP. (In that case an informational page was substituted for the missing content telling you what MMP publication it appeared in, we hope to see Out of the Bunker re-printed by MMP when they can, it is available in the aftermarket). Also Dispatch #44 (The Rees HASL) is $5.00. If you want the Digital Works (a 4 issue RE-subscription plus all 44 Back Issues) it is now $60.00 until my October Update comes out (normally $65.00). Thanks so much for your continued interest and support and look for #45 in late September, Your ASL Comrade, Vic.